Wow, it's been ages since I've been out to one of these things. I didn't get a chance to play, but I did hang out for a bit and chat. 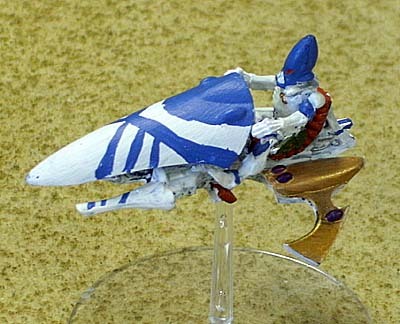 I happened to catch a glimpse of one of the regulars Daughter's Eldar force underway. She's only 11, but is already taking on complicated color schemes that involve white. Look out guys, with a little bit of practice, she'll be teaching us how to paint. 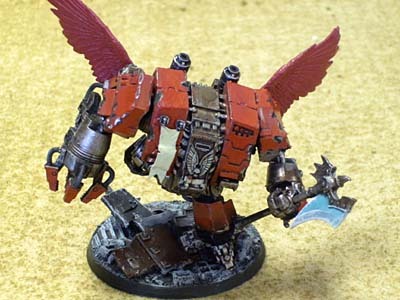 One of the other guys brought in his dreadnought where he'd added a new, larger weapon in it's hand and magnetized wings for the back. I give him so much grief for playing Blood Angles. I just can't see playing them. Flying dreadnoughts, who ever heard of such a thing? And then I saw this thing and had to snap a pic of it. For those who don't know, it's an Ork Fighta Bomber. The owner is in the process of building an actual one, but until then, this is what takes the field. There's an Ork down there near the base for scale. This is no small model my friends. And he had a few additional smaller fighters as well proxied. I do suggest using certain lego pieces for terrain, as some are practical and even up to scale! 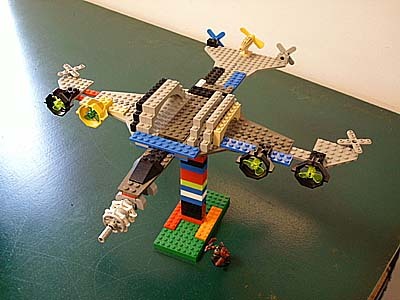 Waaaay back, I used to keep a small container of Lego bricks handy to use for wrecked vehicles and buildings.